Last week I wrote about the new British Airways ‘241’ First Class trial that is running, called ‘Dream Tickets’. It has proved popular with Head for Points readers – I’ve heard from around 15 who have booked at £3,600 to £4,000 per couple and I assume there are many more who didn’t get in touch – so I thought I’d give it another mention before it ends. The first ‘Dream Tickets’ deal is Cape Town. As you can see on this page of ba.com, you get two First Class tickets to Cape Town from Heathrow in January, February or March for just over £4,000. Unfortunately, availability on the DIRECT flight back from Cape Town is now very limited. You can get down OK but, coming back, it is very hard to find dates which don’t require you to change in Johannesburg. On the upside, you get another 10 (EDIT: according to the comments, not 40 as I wrote) tier points for doing this. If you can find dates where you can get the direct flights in First Class in both directions, you can save £300 per couple by booking here at the BA Holidays premium holidays site. Book your First Class flights for two people and throw in a car rental on top. For a seven night stay in March, you will pay around £1,800-£1,900 each. It is far cheaper than just booking the flight on its own. The snag is that BA Holidays will usually (although I have seen reports of exceptions to this) only price up when you are on the direct BA flights in both directions and there are few days left where you can do this. Do give it a go before booking ‘flight only’ though. You must book by 18th July for travel between 1st January and 31st March. 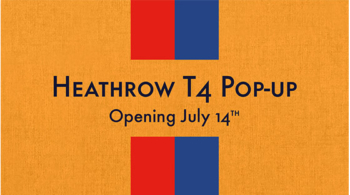 Tomorrow, Saturday 14th July, Louis Vuitton is opening a pop-up store in Heathrow Terminal 4. “The pop-up concept is inspired by the ‘My LV World Tour’ collection that pays homage to Gaston Louis Vuitton’s private collection of destination stickers and symbolises the art of travelling and exploration. Going to the Goodwood Festival of Speed? If you at the Goodwood Festival of Speed today or over the weekend, here is something to look out for. The Waldorf Astoria Viewing Platform is a new viewing area launched this year. The public can, subject to space being available, go onto the lower level. However, if you have Hilton Honors Gold or Diamond status you can access the exclusive top deck. As well as better views, you will receive free champagne and be able to enjoy Waldorf Astoria Red Velvet cupcakes! You don’t need to have your Hilton Honors card to hand but you will need to be able to give your account number to the staff on duty. Alternatively, download the app and put your status card into your mobile wallet. There is no mention of guest access but it would be odd if a +1 was not allowed. Nick sent me a couple of pictures – the top deck is pretty much deserted because Hilton never told people about this deal! If you download the Goodwood app you can find confirmation of these details on the page explaining how the Waldorf Astoria Viewing Platform operates. Thanks to Nick for this (and the pictures I added later). OT: Has anyone received a Lloyds Avios Upgrade voucher since the demise of avios.com? I passed my spend threshold about 6 weeks back, but I’ve not received a voucher into my avios.com (which is still active) nor any letter/email saying it’s gone somewhere else. Both Lloyds and Avios customer service just blames the other! Thanks! It normally gets applied in the following statement month after you trigger it (so trigger it in June, it gets applied on July’s statement date), however, they can apply it to your account manually so I would get back onto them and insist you need this doing as you need to use the voucher urgently. This worked for me during the IT glitch. I got one recently after hitting the 7K spend early June. I got one about 2 weeks ago into my avios.com account. Totally irrelevant: has anyone used MyleFly? seems to be against the T&Cs of every mileage programme going! Thanks for your original heads up on this BA CPT offer. We paid just over £3700 which included direct flights and a car for the 20 days. Your readers need to be aware that Cape Town has been suffering from a severe drought which has got much worse over the last 18 months; so if they are planning to go then they would be advised to think about driving eastwards, towards Hermanus, and beyond. It is a very beautiful country with great food and wine, as well as nice people. I went to Cape Town last October and again at the end of May. Both times was caught in plenty of rain (and sun), but the dams/reservoirs that serve Cape Town are apparently out on the flats, where it is that bit drier. Just booked our flights to Cape Town – first time for me and very much looking forward to it. Seems to be a few people here that have visited before, with that in mind, any tips/recommendations on hotels for a couple? Looking for reasonably chilled and relaxed but with the ability to get out and about for at least a couple of tours etc. My go-to hotel for many years from 2000-2015 was the Radisson Blu Hotel Waterfront. Always try to get a club room as it included breakfast and bigger room with better views. Well located, maybe a 10 minute walk from the shopping area, restaurants and harbour. But also within walking distance of some nice parks and beaches in the other direction. Opposite the stadium. Fabulous hotel bar right on waterfront (not swimmable as rocky outcrop); see dolphins from your bedroom window most mornings. Not sure what price is these days, but always treated this as my home away from home. Get out of Cape Town into the winelands. We stayed at Avondrood Guesthouse in Franschhoek in a great room with private garden. Would stay there again. Re food, Le Petite Colombe in Franschhoek (also in Constantia) fabulous. The Fork in Cape Town (a tapas fusion place) is better than anything we’ve had in Spain. OT: LHR T3 tomorrow with no status, what is the best PP lounge please? Aspire and No 1 are both very pleasant, more chance of getting into Aspire. If you want No 1 I’d pay the £5 reservation fee online. You should all visit The Silo in Cape Town. Either to go to the art museum or have a drink in the hotel bar. We stayed at the Lawhill Luxury Apartments which is right next to the One And Only. The One and Only has the biggest and most opulent breakfast buffet I think I’ve ever seen (it was not a bargain option). OT – just back from a paid CW trip to Seoul/Tokyo. IFE across the whole plane did not work for the LHR-ICN flight and service by cabin crew was very mixed if I was being kind, I really wasn’t looking forward to return flight. The Tokyo flight back to LHR was the complete opposite, it was probably the best and most enthusiastic service I have had on a plane even compared to Emirates/Etihad First. The service lifted BA CW into a very enjoyable flight back…. Also, I booked a couple of hotels in Tokyo via Emyr at Bon Vivant. I was thoroughly impressed at all the extra touches that were provided. If you are thinking about booking a luxury hotel then definitely make use of his network. Compensation in Avios is paid for duff IFE, do claim. Glad it worked out well with Emyr. We are visiting hotels in Tokyo booked by Emyr very soon. Very pleased it went well. OT – Amex Plat insurance. Lost my phone whilst on holiday and put in a claim through my card. I have now been contacted by AXA Claim Validation Team to arrange a meeting. Are they suspecting me of fraud? I have never in my life made an insurance claim before (ignoring a car crash a few years ago) and now what I was hoping would be a straight forward claim looks less so. Is this normal? Thanks for heads up on CPT 241. Three couples booked on 08/02/19 direct. Would have actually preferred one way via JNB to try out 787 version! OT – I recently had a trip to paris orly for work. I chose orly due to the meetimg takimg very close to that airport and went out of my way to fly lcy on ba. Flight out was fine but flight home was cancelled and had to fly cdg to lhr instead. I semt them the bill fpr the taxi to cdg which they duly agreed to pay bit i then complained further given that I had to cancel a meeting as a result of needing to travel to cdg instead of 10 mins to ory. Plus then trek to lcy and pick up my car from Heathrow. Was I being reasonable in expecting them to chuck me a few Avios? They advised that there was nothing they could do other than reimburse my taxi amd that was final. I cant help but feel a little annoyed…. I need to book a flight to sfo in the next week for three of us and was planning to go BA but might think again. Has anyone else been in a similar situation? Why was the original flight cancelled? How delayed were you getting back to LCY? Cancellation means cancellation of original flight – re-routing doesn’t affect the right to compo. Claim online and EUR 125 should be yours with no quibbles expected unless they quote extraordinary circs, ATC etc. Operational reasons are not extraordinary circs. To me it reads as though i am not entitled to anything given it says depart more than one hour before and land less than two hours after to get any compo? It’s more straightforward than that. Your original flight was cancelled —> compo. Just because they got you there on a different flight at pretty much the same time does not negate your right to compo for the cancellation. It’s not being greedy. You were inconvenienced. OK I see your sticking point. They didn’t give you an alternative flight from the same airport, to the same airport. If they had changed your Orly – LCY flight for another, within the timeframe, then no compo. But they changed it to CDG-LHR. Is anyone still waiting for IHG Creation points to post this month? With my points credit this month, I should qualify for SE but points have not posted to account, statement generated 2/3 days ago. Normally points post within a day or two. Completely OT, I remember reading on here to link your SPG account to Amex MR you have to put some 0’s in. How many please? OT: I should know this, but I’ve forgotten! When you go over the one year card anniversary of the Preferred Rewards Gold card, can you cancel and get a pro-rata refund? I know it’s like that for the plat. Also, if you have charges on the card (and want to cancel), can you just ask to pay off the bill when you cancel? I’m assuming you don’t need to wait till statement day?